Excuse our wintery look. We are green from spring to autumn. 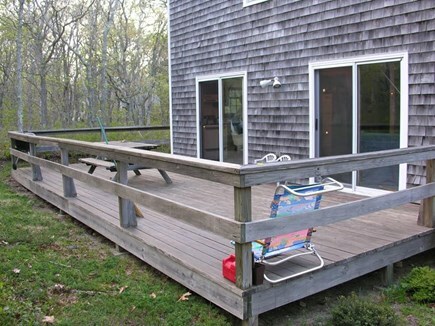 Deck with charcoal grill & picnic table. More furniture coming. Here is a tidy Cape set way back off the road with nearly no road noise. Entering you are welcomed by a view of the living/dining/kitchen area. 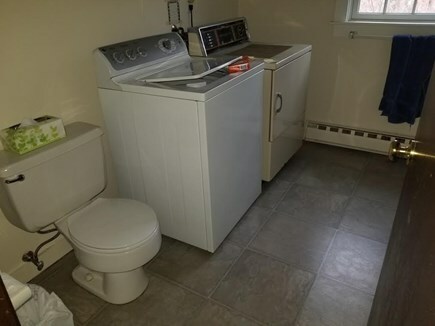 Adjacent to that is a bath with shower and washer/dryer and two bedrooms. One has a pair of twin beds and the second has a queen bed and a twin bed. Upstairs there is one bedroom with a king size bed, a full bath with tub/shower and a second living room with TV. .
A slider off the kitchen, leads to a wrap around deck with a charcoal grill, picnic table and other outdoor furniture. There is parking space for two or three cars. This is a great vacation home for a family looking for a modest rental rate in a quiet setting. It has a long history of returning guests. Again this year nearly all the weeks are reserved by these returning guests. A few are left for you. We believe this guest history is an excellent recommendation. Please inquire about Windsor Cape. Additional pricing info: Cleaning fee $150 Refundable security deposit $300. $400 for a family with a pet, State and local taxes of 9.7% will apply.